Georgetown, MA, February 5, 2009 - UFP Technologies, Inc. (NASDAQ: UFPT), a fabricator of custom packaging and component solutions, introduces BioShell™, a single use bag protection system. BioShell is designed to safeguard bags during storage, handling and transportation. It can handle multiple drops at -70°C. It is made from high purity, USP Class VI equivalent foam with a glass transition temperature of -85°C. BioShell is lightweight, easy to handle and is created to save space. Each BioShell is custom created for user's bags, equipment and processes. With its adjustable thermal conductivity, BioShell can adhere to any freeze/thaw cycle. User specific bag dimensions, port and hose locations, storage, handling and transportation equipment determine each design. The single-piece system follows bag's contours and braces it without additional internal components or dunnage. BioShell has a dual-density foam construction. The inner layer is soft and provides the cushioning required during accidental drops. The outer shell is of a firm, high density foam that gives BioShell its structural integrity and puncture resistance. Even at -80°C, the system retains its flexible cushioning properties to protect bags against multiple impacts. BioShell is made from lightweight foam that significantly reduces shipping costs compared to heavier solid plastic materials. Nestable and stackable design minimizes space required in storage and transportation. 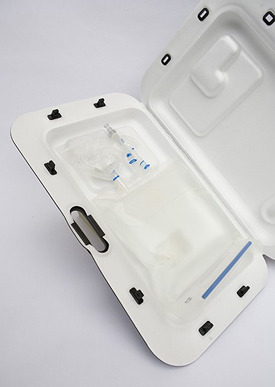 BioShell is made using high-purity, non-particulating, clean room suitable foam. Foam is converted from rigid plastic using only nitrogen without any traditional, usually toxic, foaming agents. It is shipped clean room-ready. Its robust structure is designed not only to protect its contents but also to last in a returnable system. For more information about BioShell visit www.bio-shell.com, call (800) 372-3172 or email info@ufpt.com. UFP Technologies, Inc. (NASDAQ - UFPT) is an innovative designer and custom converter of foams, plastics and natural fiber products. The company serves its customers through three major brands: United Foam, Simco Automotive and Molded Fiber; producing a vast array of custom-engineered packaging solutions and component products in ten manufacturing facilities across North America. Its customers include leading companies in six core markets: Automotive, Computers & Electronics, Medical & Scientific, Aerospace & Defense, Consumer and Industrial.